Budget Codes are designed as a way to keep track of the budget accounts for your organization. You can identify the appropriate budget code for labor and material transactions and run reports to track those costs. Enter the Budget Code name and Description. Define the Fiscal Year Budget Monies. *Note: Viewing the Budget Codes List page will show you the remaining amounts in each budget account. If you leave the Fiscal Year Budget Monies as $0.00, the system will show you the total amount charged to that budget. 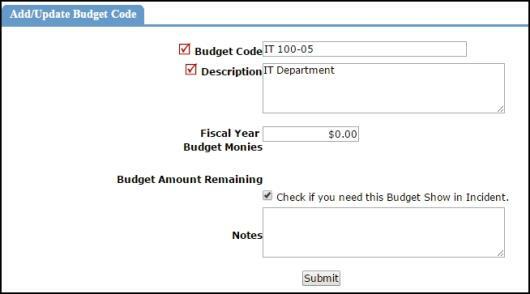 To edit an existing Budget Code, click on the budget code name from the list page. Edit the necessary field(s) and click the Submit button to save. To deactivate a Budget Code, click on the budget code name from the list page. Put a check in the box to make this an inactive budget and click Submit to save. *Note: If a Budget code is marked inactive, it will still appear on reports and advanced search criteria, but it does not show as a selection option in MyFacilityDude, on the Incident form, or when adding Transactions. To delete a Budget Code that has never been used, click on the budget code name from the list page and click the Delete Record button. A budget code that has been selected on incidents cannot be deleted until you have removed the budget code from all transactions and incidents that it has been associated with.